Founded by educators in 1910, Pi Lambda Theta is the oldest national educational honor society in the field of education and has the most stringent academic requirements. The mission is "to honor outstanding educators and inspire them to be effective leaders who address critical issues in education." There are more than 100 chapters throughout the United States and the Philippines. More than 148,000 men and women have been initiated into Pi Lambda Theta. 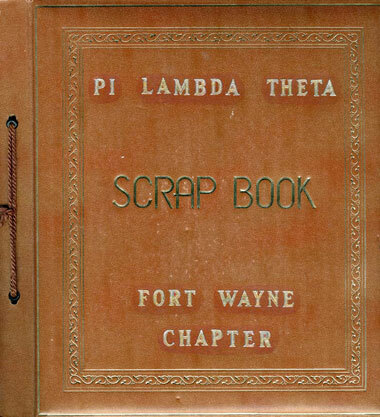 Pi Lambda Theta Fort Wayne Area Chapter was founded in 1948. This chapter consists of a diverse group of educators, professionals, students, and retirees. 52% of all past presidents are still active in the organization. The strength of the Fort Wayne Area Chapter rests on the foundation of strong leadership, past, present, and future, and an aggressive outreach strategy. Users can continuing browsing into the next scrapbook when they reach the end of one scrapbook. On the pages containing the scrapbook images, the title at the top of the page indicates the scrapbook to which the image belongs. In addition to the Table of Contents pages, the collection can be searched by words in the file name in the search box below.